It’s hard to think of a worse start to a winter day than turning on the faucet and … nothing. Maybe there’s a trickle of water, but it’s clear you have a frozen pipe. So, what now? At Soucy Insurance, we are dedicated to helping you shield yourself from financial loss. See to your outdoor water lines: Drain water sprinkler and swimming pool supply lines, and remove, drain and store outdoor hoses. If possible, close inside valves supplying outdoor hose bibs, and open the outside hose bibs for draining. Keep them open so any remaining water can expand without breaking the pipe. If you can’t shut off the water from the inside, pick up some foam faucet covers. Tend to those pipes: Leave the cabinet doors open in the kitchen and bathroom so your pipes are not shut off from the warm air. You can also insulate your pipes with sleeves, heat tape or heat cable. Insulation is especially important in unheated areas, such as your attic, basement, garage or crawl space, and for pipes running along exterior walls. 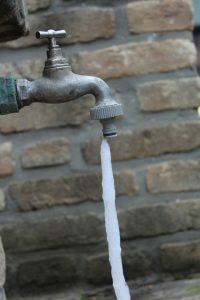 During severe cold spells, you may want to leave all faucets, both hot and cold, running at a slight trickle. Call in a professional: Frozen water in your pipes can cause them to burst, meaning you’ll have a mess on your hands once that water thaws. So, act quickly to shut off your main water supply, and call in a licensed plumber to see to the situation. Finally, be sure to touch base with your Soucy Insurance agent at 762.2218 to check whether you’re covered for the damage a frozen pipe may cause. We’re happy to answer all of your policy questions this winter, and beyond.